Despite the cultural importance of the scop, this style of performance disappeared as a genre during the Middle Ages. Scholars cannot agree on the reasons for the extinction of the scop. Were these poet/performers merely the victims of changing times and tastes? Did the expansion of the Catholic Church into Europe adversely affect their popularity? The Teutonic fighting spirit nurtured by the boasts of the scops was based on a self-perception that was domineering and supremely self-confident. 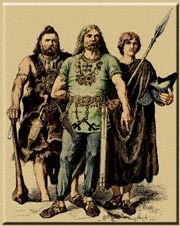 The Germanic tribesman was encouraged to look at himself as the equal or better of anyone he met so that he would have to courage to stand in battle. The ideal Christian, in contrast, was submissive and humble; always cognizant of a power greater than himself no matter his earthly rank. Christianity was a philosophy designed to aid in living justly and morally among other civilized people. New Testament thought as found in the letters of the Apostle (and urbanite) Paul stands in contrast to many of the beliefs of the warlike Israelis of the old Testament -- and to the warlike Germanic tribes and their scops. Boasting promoted a self-perception that was more incompatible and threatening to Christianity than did a belief in a pagan deity. At least if the European natives worshipped some earth spirit, they acknowledged a power greater than themselves. 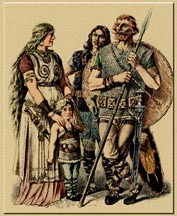 Men like Beowulf were taught by their culture through their scops to believe themselves to be the sum of all things. Also, during this time period, the organization of the cultural communities of Europe changed. As literacy and Mediterranean culture invaded the tribal North, communities transformed from warring co-operatives of hunters to peaceful amalgamations of agrarians. Tribal structures were replaced with more hierarchical organizations capable of controlling greater numbers of people over distances. This spawned changes in the relationship between ruler and subjects. Middle management came into being. It became possible and preferable to solve conflicts through mediation rather than through confrontation because of the greater numbers of people involved and the potential damage to agrarian interests. Warriors begin battles with boasts that may be words of power for them: boasting is most objectionable to the gods for a corresponding reason: the possibility of man's acquiring through his words the power that he clearly wants (Frye 6). What Frye says is true of deities, I would also say was true for monarchs. When government was carried out on a larger scale, access to power had to be limited and restricted. 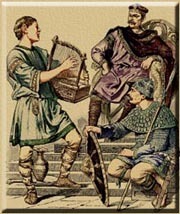 Common men had to be discouraged from believing that they too had the noble spirit it took to rule. For this reason, the boasting mouth of the scop had to be shut. By doting instead on its new favorite, the Church, who taught submission and piety, I think that in the final analysis it was probably the State killed who the scop -- not with a single decisive blow, but through gradual starvation.